My 5: Wat Pho, Bangkok. 1. April 2015. Bangkok’s oldest and largest temple is an absolute must see, chiefly due to its world famous forty-six meter reclining buddha. Built in 1832 during the reign of King Rama III, the statue shows the passing of the Buddha into final Nirvana following death. 2. April 2015. The sheer magnitude of the buddha, known in Thailand as Phra Phuttha Saiyat, simply has to be seen in person to be fully processed. 3. April 2015. As you make your way through the hall from head to feet, take note of the 108 matching bronze bowls for donations. Even the smallest offering is said to bring good luck. 4. April 2015. 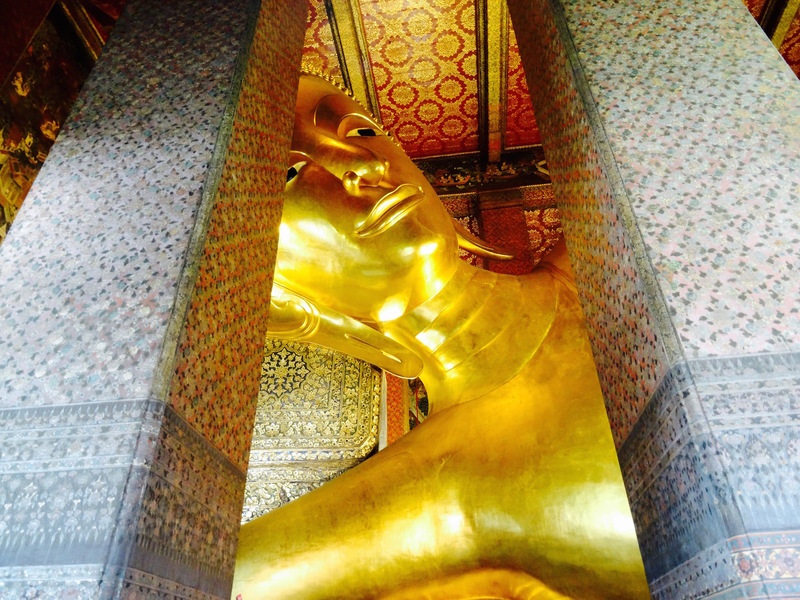 Wat Pho isn’t just about The Reclining Buddha. There are over a thousand other Buddha images and around a hundred chedis, some of which are dedicated to the kings of The Chakri Dynasty. This photo takes in the somewhat curious Buddha Bathing Ritual observed during Songkran. 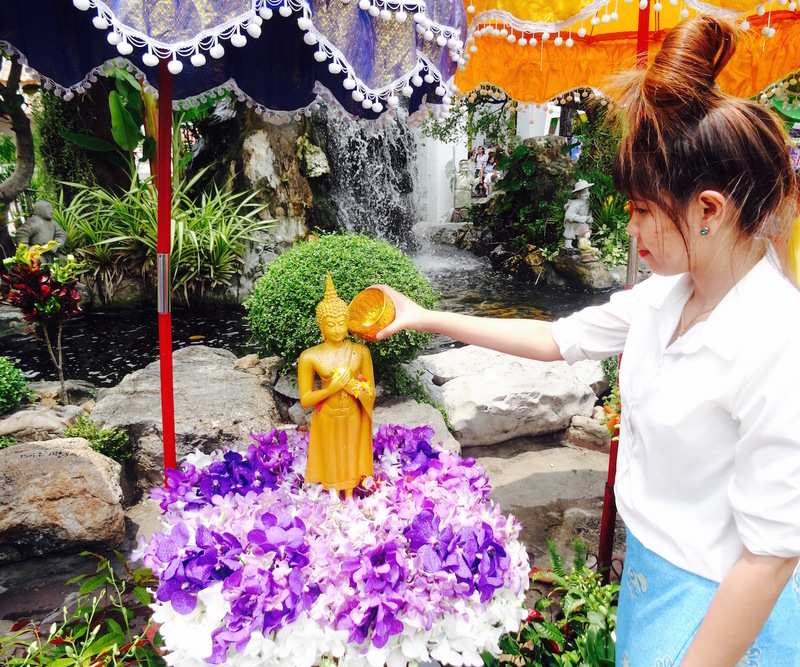 Visitors pour jasmine scented water over the buddha statuettes as a way of earning merit. 5. April 2015. There was an army of monks in residence on the day of my visit, with long lines of Thais queuing up to get a few moments of their time. From what I could see these meetings involved a brief exchange of words, a personal blessing and the awarding of an orange bracelet to mark the occasion. 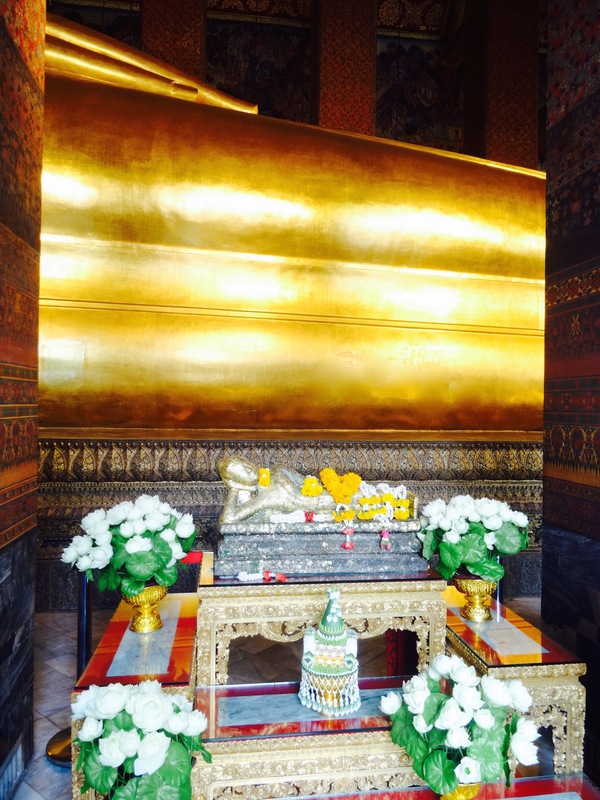 Wat Pho is open daily from 08:00-18:30, though it does close for lunch between 12:00-13:00. Entrance costs 100 Baht (£2.30/$3/€2.60).